Bryce Harper returns to Nats Park Tuesday night after a seven year run as arguably being the face of the Nationals. He’ll have his fans, he’ll have his haters, and he’ll bring with him bus loads of members of his new family. The $330 million question for the night is how will Nats fans react. The details on the Bryce Harper contract saga are starting to flow out, with new information coming from Barry Svrluga on Monday. Based on the known facts we can start filling in the blanks on the motivations of the parties involved. First, Ted and Mark Lerner made Bryce a high dollar offer immediately upon the completion of the 2018 season, 10 years for $300 million with payments spread out over 30 years according to Svrluga (and reported early on by Talk Nats). A very significant and serious offer. Had Harper accepted on the spot he’d be playing for the Nationals today at a higher AAV than he received from the Phillies and he’d be a free agent again with a few good years left. Then in February Mark Lerner dropped a bombshell. The initial offer had expired and the Nats had moved on. Not a huge surprise based on the Corbin signing, but stunning to hear it from the managing owner. That of course brought into question whether the Lerners ever really expected Harper to sign based on the knowledge that Scott Boras intended for his client to test the free agent waters. Unknown publicly at that time and revealed in the Svrluga article, Ted Lerner had already made a second bid, in a brilliant negotiating trick move he lowered the total value to $250, extended the term by two years, and extended the deferred payments by 30 years. Understandable that Harper reacted with “What does this do for me? What does this do for my family?”. The lingering question is what was Ted thinking? Did he really expect Bryce to accept the offer? Was this a message to Boras on how the Nats will approach future contract negotiations? Finally, Rizzo chimed in noting that Harper and Boras never responded with a single counter offer. So we are left to speculate whether either side ever really wanted to make a deal. Were the Nats making offers that they knew would be leaked to appease the fan base? Did Harper ever have any real interest in returning to DC? The answer to that last question is very likely no, based on the response from anonymous ex-teammates who privately trashed his work ethic to Tom Boswell. Once Harper picked Philly he began to lather up their fan base with praise for the city. Understandable that he’d want to kiss up to his new fan base. But strangely all of his praise for Philly came off as back-handed slaps at his previous home town. Philly is like one big family, according to the guy who hadn’t even moved in yet. It’s a blue collar town with real people (obviously as opposed us DC wonks). Strangely he kept mentioning good hospitals for his family, as though he couldn’t find proper family care in any of the other 29 MLB cities, that last part became clear today with the announcement that Bryce and his wife are expecting. Congrats Bryce. Mixed in with all the humble mentions of his blue collar family, Harper has drawn more attention to himself than any athlete Boswell has ever seen (more than Clinton Portis?). This was evidenced in a Tweet from Bryce with a single word summing up his entire essence Fame. 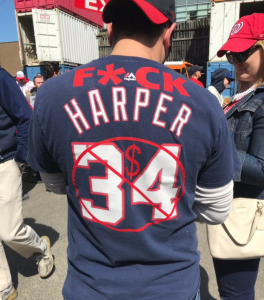 Lots of new Harper fans up 95, buying jerseys and boasting about high hopes for the future. You all know about the home runs and the hair flips, here are a few notes from Nats fans who have come to know Harper very well over the years. Bryce gets sick an abnormally frequent number of times each season. Usually described as flu, although he has a strangely quick recovery period. Here is the full list. Harper is a prototypical one tool player, power (the one tool to have if you only have one tool). His arm is a cannon but he lacks accuracy and he often chooses to over throw the play, allowing the trailing runner to advance. He came into the league as a speed guy but since his knee injury he’s slow on the base paths and in the field, much of that is lack of effort on routine plays (he reaches base on error very infrequently, often because he had given up). He’ll get his home runs but that comes at the cost of hitting for average. Harper’s slumps usually follow a power surge. He wants to hit tape measure bombs, which leads to an increase in Ks and weak outs hit into the shift. The Phillies pitching coach will soon learn that Bryce’s Dad is the only real coach he listens to and Pops likes power. What really turned a lot of DC fans against Bryce was his long history of trash talking his teammates. He publicity suggested Denard Span should be benched. He set off the fight with Papelbon by criticizing him in an interview. He openly disagreed with the trade that brought on Eaton. He referred to his younger teammates as the Sky Chiefs (AAA) in a derisive manner. And he lobbied for an upgrade at catcher (which was needed but I’m sure that Wieters wasn’t thrilled with him). It will be fun to see the reactions of his new family when he publicly suggests that the team look to improve at their positions. Finally, he cries about the umps like no one else. According to @NationalsUmp he got more bad calls in his favor than anyone on the team. But one close call against him and Lebron James would be ashamed at the antics Harper pulls. 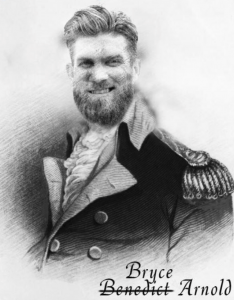 Rumors are that Harper plans a goodbye message for Nats fans tomorrow, while in a show of mutual respect the team is planning a tribute to him before the game. Surely his message will be well scripted by his media team, in anticipation of it being parsed and criticized by the DC faithful. The Nats always try to take the high road and do the right thing, in this case probably they should hold off on that impulse. The time for a Harper tribute is in his final season, 13 years from now they can put up the montage of great moments, but not tomorrow night. Cheers – Some will cheer, but with bus loads of Philly fans cheering for their new prize do we really want to join in with them? Stand and Turn Away – This is the choice picked by Ghost, a definitive rebuke. It would be fantastic if Nats fans could pull this off, but can we get enough fans to participate to hit critical mass to get noticed? Bonus points for those wearing defaced Harper jerseys. Silence – Just don’t react is the thought here, but is the lack of a reaction just as much a reaction as actually responding to his return? In any case, no chance the crowd is showing up to sit quietly. Boo – Simple and appropriate. Certainly many Nats fans will go this route. Harper seems to be encouraging this response with his heel turn, possibly wanting to emulate Werth in his trips back to Philly. Other Nats fans argue that booing is a Philly thing, DC fans should be better. But while imitating Philly fans is never a good option, why allow them to influence our response in any way. They didn’t invent booing. “Over-rated” – A very good option, not original, but based on a recent player poll from the Athletic, very apt. Harper was clearly upset by the results, referencing his MVP season, so it would hit him where it hurts. “Sixty two percent” – An even more cutting version of the over-rated chant. 62% of his peers voted him as over-rated, compared to 4% for the next highest. Only problem is that 62% of Nats Park won’t get the reference. “Papelbon” – Now we’re getting somewhere, now we’re having fun. Who knows if this will happen but who would have even thought that a DC Strangler chant would be possible a couple years ago. Plus, the three syllable name sounds sneering even when not chanted derisively. Burn baby burn – @theRallyMullet took all his #34 gear and made a nice bonfire out of them. Talk Nats does NOT recommend trying this at the ballpark. Soto’s better – A perfect mix of sweet and salty. “Benedict Arnold” – Brilliant tweet from Mayor Bowser today, with Harper’s head on our country’s most notorious traitor’s body. Big issue there is that it doesn’t really roll off the tongue. Whatever you do, don’t be late, there will be crowds at the gate and this will be a memorable night. 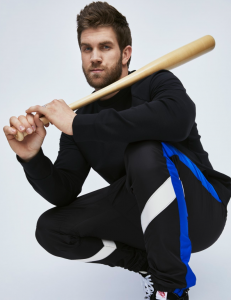 This entry was posted in Feature, Harper, Uncategorized and tagged Bryce Harper. Bookmark the permalink.